Indore, with a population of approximately 2.2 million people is home to over 1.3 million registered vehicles, with two-wheelers accounting for 3/4th of all such vehicles. As of 2015, the city had a two-wheeler density of 471 bikes per 1,000 people. Given these numbers, accidents are commonplace in the city, with 424 deaths recorded in the year 2016 (according to data from The Global Safety Report). As such, a good two-wheeler insurance can help minimise any damage caused due to such incidents, with the government making it mandatory for all bikes to have them. Note that the insurers mentioned above are not listed in any particular order. Being in an accident can be a traumatic affair, with no one wishing to experience it. Things, however, can continue to be traumatic, especially when the damaged vehicle needs to be fixed. Most insurers aim to reduce the mental anxiety and stress post an accident, offering the option of cashless garages in Indore. One can simply approach these garages to get the bike repaired, with it possible to locate them through multiple means. Insurers provide the option of finding the nearest network garage on their website. One can use the ‘network garage locator’ for this. One could get in touch with customer care representatives of the insurer and get details of the closest cashless garage from them. One could ask the sales agent to provide a list of all network garages in Indore before buying the policy. Alternately, some insurers provide these details in their brochures as well. Getting a damaged bike fixed at a cashless garage can be advantageous, offering some unique benefits to individuals. 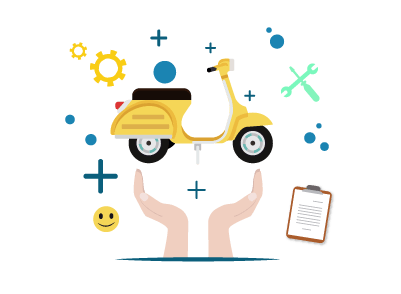 Simple – It is easy to get a two-wheeler repaired at a network garage. Most of these have a tie-up with the insurer, ensuring that one needn’t run behind anyone. All one has to do is intimate the insurer and provide the relevant documents to get the vehicle fixed. Assured quality – Getting a vehicle fixed at an unknown garage comes with its own set of risks, primarily associated with the use of duplicate/used spare parts. Network garages are unlikely to indulge in such practices, given the relationship they share with the insurer. This ensures that quality parts are used, preventing further damage to the bike. Quick service – Most network garages aim to fix a vehicle as soon as they can. This results in a quick turnover period when compared to a regular garage. Replacement vehicle – An insurer could offer a replacement vehicle while the damaged bike is getting fixed at a network garage. Cheaper – Getting a vehicle fixed at a cashless network garage is lighter on the pocket, for the bill is directly settled by the insurer. One might be expected to pay an amount only if the bill exceeds the cover limit. Purchasing a bike insurance goes beyond meeting government requirements, for a good insurance policy can help protect oneself financially in the event of an accident. Given the number of options available in the market, it is smart to consider a few important points before buying the policy. Policy cover – A third-party liability cover is mandatory for two-wheelers in India. While this is designed to protect the interests of anyone involved in an accident with the insured vehicle, it does not cater to the damage suffered by the bike. One can either choose this or opt for a comprehensive policy which provides enhanced protection. Premium – Owning a bike can be expensive, given the rising cost of fuel. An insurance premium can add on to the financial burden one undergoes. One should compare various options to find a policy which provides cover at an affordable premium. The premium amount also varies based on the vehicle in question. Policy inclusions – Each policy comes with a set of inclusions and exclusions. Choose a policy which covers a list of events, ensuring that exclusions are minimal. Policy term – Most insurers offer bike insurance policies which can range from one year to three years. Opting for a longer term can help one save money on the premium. This also eliminates the hassle of renewing the policy each year. Discounts – Individuals who have used a bike without claiming insurance are entitled to a No-Claim Bonus (NCB). This acts as a discount, with the premium reducing each claim-free year. Service – The service provided by the insurer can play a critical role during an emergency. Ensure that the insurer has a presence across the country, with a dedicated team in place to handle any queries. Claims process – Choose an insurer who has a simple and efficient claims process in place. A number of people travel across the country in search of better opportunities, and as such might end up buying a two-wheeler from a different state. While there is no restriction on the sale of such vehicles, one should keep in mind to transfer the insurance from the original owner. Failing to do this could result in no cover being provided in case the vehicle is involved in an accident. An individual looking to transfer ownership of the bike insurance can do so by following a few basic steps. Intimate the insurer about the sale of the vehicle. Mention the need to transfer ownership of the insurance policy to the buyer. Submit documents pertaining to the sale of vehicle to the insurer. These could be the NOC provided by the regional transport office, the registration certificate of the bike, etc. The new owner of the vehicle should meet the eligibility criteria required to purchase the insurance policy. Apply for a NCB certificate to utilise the NCB accumulated over the years. The insurance company will transfer the policy to the new owner once all relevant documents are submitted.